It takes this California grizzly bear some summer squashes and tomatoes to wake up from her winter hibernation! Between Nowruz, having guests over from Iran and the Great Britain, and traveling to Turkey, we sure did a lot of great cooking, baking and ice cream making, but to find time to sit and write about them all has been the challenging part. But the sight of the first tomatoes in my parents' garden, which thanks to the early summer heat in the Bay Area started to ripen two months ahead of their normal schedule got me so excited to talk food that I had to come here and check on you lovelies. The recipe for this tart is from Food & Wine's July 2007 issue. I've gotten into the habit of pulling the old issues of my cooking magazines each month to make sure I actually use them. As soon as I saw the ingredients list I knew I wanted to make it. Summer squash and tomatoes over pesto and goat cheese, who wouldn't want to eat that!? Sous chef has been getting into the habit of making pesto and storing it in the fridge, so that made it even easier to make the tart. And I'm sure it'll turn out as great if you make it with store bought pesto. And in case you're not a big goat cheese fan, the pesto flavor will overpower it, but feel free to replace it ricotta or farmers' cheese if you absolutely can't stand a hint of it. Preheat the oven to 425 degrees fahrenheit and line a baking sheet with parchment paper. In a large skillet, heat the olive oil. Add the squash and onion and season with salt and white pepper. Cover and cook over moderately high heat, stirring occasionally, until the squash and onion are lightly browned, about 5 minutes. Remove the skillet from the heat and let stand, covered, for 5 minutes. Transfer the vegetables to a strainer and press lightly. Meanwhile, in a small bowl, blend the pesto with the goat cheese. On a lightly floured surface, roll out the puff pastry to a 13-inch square; trim the square to 12 inches. Prick the pastry all over with a fork and invert it onto the parchment-lined baking sheet. Spread the goat cheese all over the pastry, leaving a 1-inch border all around. Top with the squash mixture. 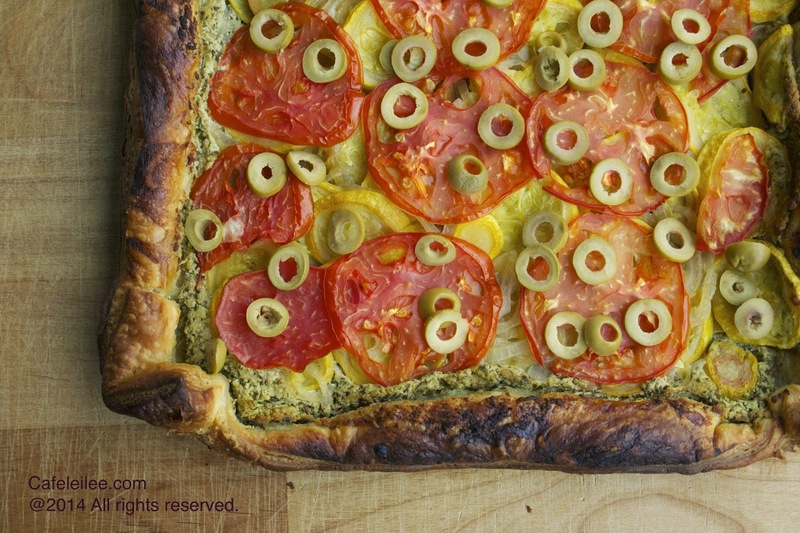 Arrange the tomato slices on the tart and sprinkle with salt and white pepper. Fold up the sides, pressing the corners together. Trim any excess pastry at the corners. Brush the pastry with the egg wash and bake in the lower third of the oven for about 45 minutes, until the edges are golden and the bottom is completely cooked through. Sprinkle with the olives, cut into squares and serve right away. فر را روی درجه ٤٥٠ فارنهایت یا ٢٣٠ سانتیگراد روشن کنید تا گرم شود, روی سینی فر کاغذ روغنی بیاندازید. در یک تابه بزرگ, روغن زیتون را داغ کنید. کدو و پیاز را به همراه نمک و فلفل اضافه کنید. در تابه را بگذارید و روی حرارت ملایم-زیاد بپزید, هر از چند گاهی کدو ها را هم بزنید, تا پیاز و کدو کمی قهوه ای شوند, حدود ٥ دقیقه. تابه را از روی حرارت بر دارید, و بگذارید برای ٥ دقیقه دیگر توی تابه بماند. کدو و پیاز را آبکش کنید و با پشت قاشق کمی فشار دهید تا آب آنها گرفته شود. در یک کاسه کوچک, سس پستو را با پنیر بز مخلوط کنید. خمیر هزار لایه را روی سطح تمیزی که آرد پاشیدید به مربع با ضلع ٣٠ سانتیمتر باز کنید. با چنگال روی خمیر را سوراخ سوراخ کنید, و خمیر را روی کاغذ روغنی منتقل کنید. مخلوط پستو و پنیر بز را روی خمیر پهن کنید, حدود ٢ سانتیمتر اطراف خمیر را خالی بگذارید. روی مخلوط پستو را با کدو و پیاز بپوشانید بعد ورقه های گوجه فرنگی را روی تارت بچینید و کمی نمک و فلفل بپاشد. کناره های تارت را روی تارت تا کنید و با تخم مرغ زده شده آغشته کنید. روی پنجره بین وسط و پایین فر به مدت ٤٥ دقیقه بپزید تا گوشه های تارت طلایی شود تارت کاملا پخته شود. تارت را از فر خارج کنید و زیتون خرد شده را روی آن بپاشید. Leilee jan, this is such a gorgeous tart. I love that you used truly fresh and in-season ingredients and the olives must give it a perfect salty pop. I will definitely be trying this recipe next week when some friends stop by!